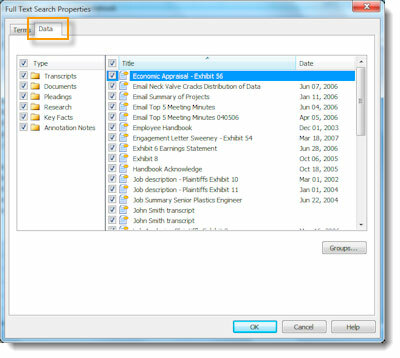 On the Search menu, click Full Text Search to display the Full Text Search Properties box. Type search terms significant to your issue and place connectors between your terms in the Terms box. Below is a list of connectors you can use. Click the Data tab to display all document types and data. By default, all document types and data are selected. 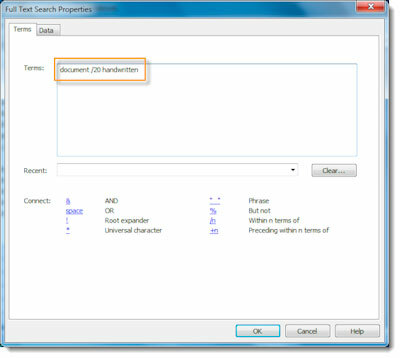 To exclude a document type from the search, clear its check box. To exclude particular data from your search, click the document type containing the data, then clear the check boxes for the data you want to exclude. Click Groups to include a group in your search, if desired. When you have finished selecting your groups, click OK in the Select Data Groups dialog box. Click OK. Information about the search is displayed under Search Results in the left pane. Use the root expander (!) to retrieve words with variant endings. The root expander must always be placed at the end of a term. For example, type contribut! to retrieve contribute, contributed, contributor, contributing, or contribution. Use the universal character (*) to represent one variable character. You can place the universal character anywhere in a term except at the beginning. For example, type gr*w to retrieve grew or grow. Use connectors to specify the relationships that should exist between search terms in your retrieved documents.